Those of us who actively and reputably work in the industry (trainers, veterinarians, groomers, etc…) know that this practice is highly dangerous, not to mention technically illegal. Even if the practitioner claims to be trained and “certified” – it doesn’t matter. Veterinary dentistry includes provision of oral health care including but not limited to: the cleaning (other than simple brushing), adjustment, filing (“floating”), extraction, or repair of animals’ teeth; and to medical treatment of and surgery performed on any part of the oral cavity. What is Anaesthesia-Free Teeth Cleaning? Anaesthesia-Free Teeth Cleaning, or Non-Professional Dental Scaling (NPDS), is the practice of cleaning an animal’s teeth without the use of a general anaesthetic, which involves holding the (awake) animal’s head still for a period of time (30 to 90 minutes at a time), scraping the plaque and tartar build-up off each tooth, cleaning the mouth of all debris, and brushing the teeth. 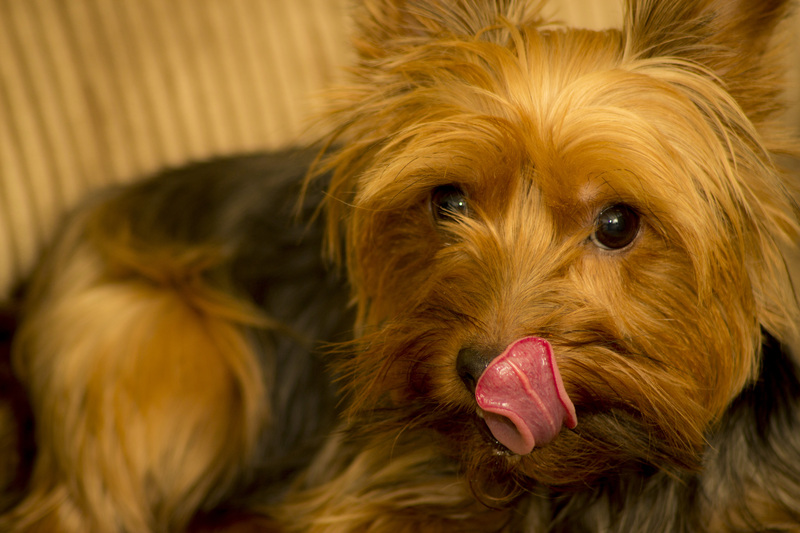 This sounds enticing especially to those whose pets are showing signs of periodontal disease. While we go in for regular dental cleanings with our dentists, we are cooperative patients and will hold our heads still during the procedure. Animals do not do this willingly. If the animal turns their head suddenly, even just slightly, they can be easily injured or the handlers can be bitten. Bacteria that rests on our teeth is not necessarily sitting politely atop each tooth – more often than not, the bacteria has found its way under the gum line. If the person performing this procedure must scrape below the gum line, one can guarantee that the animal will respond out of pain and there is great risk of the bacteria being pushed deeper into the cavity and worming its way inevitably into the blood stream. Lastly, as this is a cosmetic procedure, the results are very misleading and the owners who partake are far less likely to see their regular veterinarian regarding their pet’s dental health. This means that all the real dental issues that are not addressed during NPDS are left to fester for much longer, causing more damage. What are the behavioural risks? Behaviourally, the risks far outweigh the benefits here as well. Unless you have trained your pet to sit still with their mouth open for up to 90 minutes and tolerate sharp instruments poking, prodding, and scraping, this is going to be a traumatic nightmare for your pet. Many pets are not taught to be properly restrained for a brief veterinary exam that lasts less than five minutes. Is it fair for us to expect them to tolerate an hour and a half of discomfort? The risk for biting is extremely high, but even if they do not bite, they will have learned that any duration of restraint is uncomfortable and even painful. How do you think they will respond at their annual vet check when your veterinarian investigates their mouth? Now we have put our veterinarians at risk for a bite too. These types of traumatic incidents are called “single event learning” and this is one of the most effective types of learning in the sense that whatever happens in that situation will likely cause long term changes in behaviour. This is not ideal especially if the behaviour the animal is learning is that they are helpless and bad things happen when people touch them. Anaesthesia is not 100% risk-free, but then again, what is? What we do know is that anaesthesia has become much safer over the years and that protocols are put in place to reduce risk, and to manage each patient safely. I urge you to avoid these dangerous cosmetic procedures and instead have an open discussion about dental care with your veterinarian. No one is more qualified to discuss this with you than your licensed veterinarian. Want your dog to have better teeth? a healthy diet (high quality kibble, home-cooked or raw) – be sure that it is professionally balanced and see our upcoming blog about diet. How often should I see my vet? Here is a great chart from Dr.Karen Overall, MA, VMD, PhD, DACVB, CAAB. When dogs hit developmental milestones, it is paramount that we make appointments with our veterinarian and our trainer in order to assess the physical and behavioural health of the dog, preventing future problems and addressing current ones. I compare this to how often we visit our family doctor or bring our children to their paedeatrician. If we do this for ourselves, why wouldn’t we do this for our pets? It certainly is worth it to me! Your veterinarian will occasionally suggest a full dental cleaning that involves anaesthetic which will actually prolong your dog’s life. Oral health is the keystone to our health too. Many people say that it is too expensive or that they don’t need it. Logically, if that were true, we wouldn’t either. Please take care of your dog’s teeth as well as you take care of yours, and do so responsibly. Cosmetic procedures like anaesthetic-free cleanings are far too risky for any dog. Don’t believe the hype. Seeking submissive, robotic dog for crated companionship or avoidance. I came across a review for a trainer today that sent shivers up my spine. I wanted to share excerpts of it with you as it had such an effect on me. They wanted to introduce the dog to the cat. Except the dog had “successfully killed 13 small to medium rodents including 1 chipmunk, 10 baby bunnies and 2 skunks.” So we’ve got a dog with high prey drive and a long history of reinforced behaviour (killing) and we want to set the dog and the cat up for failure by putting them into a home together. “I thought it was cute that she followed me around the house and cried when I left. Turns out she thought she was running the show. Not so cute anymore. That’s my first heartbreak. The poor dog’s spirit is broken. A dog who had clearly been through trauma in the past and had been abandoned at a shelter, returned countless times, is now being punished in the home of the people she thought had saved her life. The dog is exhibiting obvious signs of distress through these behaviours and after endless punishment, the dog shuts down, “barely notices” the things that dogs should be happy to see, like tennis balls. But wait. It doesn’t stop here. They want to introduce the dog to the cat, remember? I’m sure that if you’ve done your research or trained with us, you know that lip-licking and ears pulled back are signs of stress and anxiety. Not calm and submissive. These are not good signs – they’re signs that the dog has been pushed beyond a threshold. How anyone can think that a “submissive” dog is what they want is beyond me. I want a confident, creative, happy dog. Not a slave. I don’t want to punish my best friend so much that they can no longer be a dog, simply a robot…but wait. There’s a little more. That sounds delightful for [Dog]. Congratulations. I’m sure that’s what she hoped for when you picked her up at the shelter that day. When the unfortunate day comes when you leave [Cat] and [Dog] home alone together and come home to one surviving animal, you will likely blame the dog and give up, sending her back to the shelter, or better yet, to be euthanized…when you should blame yourselves and your trainer. You can blame your trainer for not being educated in animal behaviour and learning theory. You can blame yourselves for not stopping to think for a moment about the best interest of the animals and for failing both your pets. I hope that day never comes for this couple, but then again, that poor dog is living a life in a shut down state, constantly being punished for having natural behaviours. Wouldn’t it be better to be placed in a loving home without small animals to prey on? Avoidance isn’t always a bad thing. Before you try to train behaviours out of your dog, ask yourself how you want to do that. Do you want to suppress those behaviours and put a lid on a boiling pot? Or do you want to manage the environment as best as you can, while training replacement behaviours? When looking for a trainer, find one who doesn’t use punishment to suppress behaviours; instead, creates a realistic training plan with you to manage the environment and replace unwanted behaviours. In light of some recent events in my own life, I wanted to write a brief post about bullying. We’ve all been there, on one side or another; the bully, the victim, or the bystander. These are not the fondest memories of our childhood but hopefully they’re a distant memory. I’m particularly sensitive towards the subject as I was often a target as a young child as I was not the prettiest, not the most athletic, not the most popular. Once high school hit, life became easier in that department and more challenging in others, of course. I’ll never forget the days of being pushed around on the playground, physically assaulted, gossiped about, teased, outcast and ignored. It takes a toll on one’s self esteem and really affects how we view other people. I wasn’t a fighter. I was feisty, but when you’ve been beaten down, you lose your fire. I preferred to hide away and just wait until dreaded recess passed. I couldn’t wait until the bus pulled up to my street and the two popular girls would take whatever jewellery I had and let go of my hair so I could get off the bus and ice my bruises from being shoved into lockers and smacked around. I sought relief, not continuation. The information I was receiving seemed confusing. Teachers told me to report the bullying; this would ensure more bullying or worse bullying later. Nothing worse than being a tattle. I learned that quickly. My mother said to walk away; this would sometimes work and other times encourage following or being accused of being a wuss. My father said to ignore it until it got physical and then stand up for myself as needed. Strangely enough, it was the right information but I didn’t know when which reaction was appropriate and when to apply this new knowledge…so I just hid, passed the time, and hoped someone would be nice eventually. Bullying behaviour is generally based on a lack of self-esteem and/or a lack of self-control and social skills. Sometimes we find that these bullies have challenges in their own home life (abuse, neglect, etc…). do not listen to others who say “oh it’s okay – my dog will tell yours when he’s had enough” – it is not acceptable to allow bullying or to put another dog in a situation where they should have to defend themselves. supervise closely; at the first sight of bullying behaviour, gently remind the bully’s guardian that your dog is uncomfortable and insist that you would like them to restrain their dog until you can retrieve yours. If they do not comply, intervene if it is safe and remove your dog. Oftentimes we see this behaviour and we stand back, but I do feel that we have a responsibility to speak up if no one else is going to be an advocate for their dogs. Sometimes just a gentle nudge is all that is needed. Sharing a brief anecdote (about you or someone you know) can also help the person feel like you can truly relate and understand; it also makes you more credible. It’s best to avoid confrontation or accusations as this will only cause the person on the receiving end to become defensive and stop listening to anything you have to say. Sympathizing or empathizing is generally the quickest way to win a person over and keep the lines of communication open. Recently, I was bullied by a client who had signed up for my classes. After our orientation and a few phone calls and emails, I recommended they see the vet because I was concerned about the puppy’s health and felt a checkup was necessary. After a day’s delay, they saw the vet and sadly, the puppy was feeling so unwell that he “tried to nip” the staff while being handled. This is very common not only for puppies but for anyone (animal or human) when one is not feeling well. The client was told that his dog was aggressive and that they needed to nip this behaviour in the bud as the vet had seen this type of aggression before and it turned ugly. He was then told that the dog would need “more than clicker training to get rid of the behaviour”. Needless to say, I was floored. I sent this vet business and in turn he took mine away. I suppose this vet or his staff have not actually studied psychology, nor do they understand what ‘operant conditioning’ means. Either that or he gets a large cut from a training franchise for referrals. One can only speculate. The client demanded a full refund from me and I declined as the process had already begun and I would be happy to transfer his credit to behaviour modification if he was truly concerned about the behaviour. I spent over an hour working on an email with a list of resources and helpful advice only to be slapped in the face with a list of threats to report me to the Better Business Bureau and have his lawyer contact me and then finally a threat about my reputation in the area. My heart was broken, not only for this dog who would likely be going to a local “yank and crank” as we call them (correction-based trainer) to have his so-called “aggression” jerked out of him (otherwise known as “suppressed”), but here I am in grade 7 again with the school bully. I sent a full refund back to him with a note to explain my displeasure at his bullying tactics and I moved on. This is now one of my biggest regrets in business. This client did not deserve a full refund as I had spent much of my time with him, I provided him with tools (clickers) and resources (in person and online) and I have a policy that I must uphold, like any other business. I learned my lesson; not to give in to the bully because then he may be reinforced and turn the bullying on his own dog. Next time I will risk the negative Yelp review and I will stand up for what I believe in, which is me and my business. I know I do a good job and that my clients are happy. I know that I have solved dozens of cases with a clicker and have not had to resort to “beating aggression out of a dog”. I also know how it feels to be bullied and I will not go there again. Now I must move on to the clients who are committed to humane methods and relationship-building with their dogs; they are the ones who are deserving of my time and efforts. To answer your question, yes and no. When training dogs, I use whatever the dog finds rewarding. It’s not something that we can choose for them – just like I can’t choose what you find rewarding. One of my dogs is not overly food-motivated; he is motivated by scent…so much of our training is done while outdoors and I can use a “go sniff” as a replacement for “here’s a treat”. My other dog is incredibly food and toy motivated, so I alternate between them depending on the moment. When a trainer uses punishment (or even a “balanced” method using treats and corrections), you get confusion. The dog takes a chance every time he’s asked to do something. There’s a 50% chance that he’ll get rewarded and there’s a 50% chance he’ll get yanked by his neck. That makes for a fearful, anxious dog who cannot learn in that environment. If the dog is a strong-willed dog and can withstand that punishment, he may tolerate it for a while but then lash out and bite later (this is what happened to me early in my career when I used corrections – I got mauled.) If the dog is meek and “soft”, he may simply shut down and avoid all interaction with people as they bring fear and pain. I have signed a code of conduct that states that I do not use fear, punishment, pain, intimidation to train dogs. I treat dogs with respect and in turn, I work with the happiest dogs who trust people, listen to their guardians and are wonderfully successful. When I do use treats, we wean off very quickly so that there is no dependency. We replace the treats with toys, affection, scent-games, socialization, whatever the dog finds rewarding. This is the only method that is scientifically proven to work with dogs. You might ask “how do you discipline your dog?” Instead of punishing, I set the dog up for success by preventing problems, teaching alternate behaviours before bad habits are built, and redirecting any behaviour I don’t like. “Positive” doesn’t mean “permissive” – I just can’t justify punishing a dog if I haven’t taught him what I’d rather he do. When dealing with puppies, it’s so important to use food as a reward as it’s what they understand, and the process is much faster (and more enjoyable) for both of you. If a trainer is not using food when training puppies, I can only imagine what they are doing to train them. Likely corrections. Imagine punishing an infant – it’s the same thing. There is so much conflicting information out there, but if you keep your focus on science-based training rather than television shows or “overnight trainers” (ones who just hung a sign saying “trainer” without any education or training), you’ll do just fine. Often, I get asked a question that sparks a blog post. Here is another. When we bring home our dog from the breeder, we have these ideas in our minds about obedience and what we’re going to accomplish with this dog. We work so hard, putting our blood, sweat and tears into training our dogs and sometimes we get so caught up in the process that we don’t enjoy the dog. We forget that our dogs are still dogs and while we’re busy teaching them cues and behaviours, they’re being so accommodating and compliant but sometimes they just don’t want to do it. A couple of years ago, my marketing was covered in the word “Obedience” and every client that came to me said “I want my dog to be more obedient”. It never sat well with me as it triggered flashbacks of my early days of forceful dog training (corrections and the like). One day I woke up and decided that the word would no longer be in my dictionary. I would replace “obedience” with “training” or “teaching”, and “command” with “cue” or “signal”. I would not treat my dog as a slave who must obey me, rather a companion that has free will but has been taught appropriate behaviours and my language so that he can understand when it is imperative that he listen to me (for safety or simply for reward). It changed everything, having those words replaced. It felt so much better and suddenly my relationship with my own dogs was different. A common question I get as a trainer is about loose-leash walking. I always laugh because Parker doesn’t really walk loose-leash. If you’ve ever seen me with my dog, he’s rarely in a perfect heel and the leash is rarely draped in a lovely U from his collar/harness to my hip. He has three legs and needs momentum. This means, I’m the sled that he pulls around the city for the most part. I’m okay with this. He’ll heel if I need him to and he’ll walk nicely if I ask…but frankly…I rarely ask. He does everything else so beautifully and this is the one thing I don’t really care about with him. As for the first walk of the day, I never ever make my dog heel or even walk nicely in that situation, to be honest. They’re so desperate that it’s all they can think about and frankly, it’s one time where I personally don’t care about training. Dogs have to be dogs sometimes and if that’s the only time he pulls, I don’t see it as a problem. I let my boys pull me (not literally) down the street when they’ve got to ‘go’ – I run with them so that they can get there faster. Once that business is done, both my dogs are so much more receptive and appreciative. Look at it this way: when I have to go to the bathroom first thing in the morning, I don’t stop and offer 10 minutes of niceties to my partner – I just get from bed to bathroom and when I’m finished, then we can have a conversation. Business is business. Too much information. I know. My theory (even as a trainer) is that dogs cannot be expected to be “robots” and to be completely obedient (oh how I hate that word) all the time. There are times where I need my dog to defer to me and to respect my wishes, but there are also times where I need to let him be a dog and do what he wants (when it is safe). If my dog doesn’t listen to me in a situation, I simply take note and file it for later so that I can figure out why the motivation wasn’t strong enough, what his reinforcer was and why it was so strong, or if he simply *really didn’t want to do what I was asking of him* because of another factor that I wasn’t aware of at the time. I’ve learned to watch him carefully and assess the situation first. If I have any doubt about him responding to my next cue 100%, I don’t ask for it. I wait for an appropriate time, or if it’s an emergency, I go into management mode. We can’t read their minds, but sometimes they’re too nervous to sit, too tired to do a perfect heel, too emotionally taxed to offer a hand target or a complicated behaviour chain. Most of the time they do it because we’ve spent so much time “programming” it into them, but they just want to be dogs and they work so hard to please us and our silly requests that they deserve it. You can “be the cookie” all you want, but sometimes they just want to “be”. I went to a Christmas party a few weeks ago and when I was introduced to people as “that dog trainer I was telling you about”, I wanted to curl up under a table somewhere. I’m proud of what I do and I love it…but sometimes I want to be “Caryn” and not “Dog Trainer Caryn”. As soon as I heard the first person say “Maybe you can answer this question…I have a dog who…” I cut them off and said that I’d rather not “talk shop” but they can call me after Jan.2 and here’s my card. I realized then how important it is for Parker and Buster to have time where they don’t have to be “obedient” because if I had to be “on” all the time I’d likely lose my mind or start hating people in general. What an interesting weekend…to say the least. I’ve been burning the candle at both ends recently and you may have noticed since my post-session notes are days late and I’m likely frizzy-haired and cross-eyed when you see me. I moved from Toronto to Oakville last week and the commute is about two hours each way on transit. (Yes, I’ll be getting an iPad for the GO ride in a couple days!) I love that during those two hours I can read, catch up on voicemails, write notes and maybe even catch a few extra Zs. The downside is that my cancellation policy has had to become far more strict which makes me feel like a grumpy ol’bear at times. First lesson deposits are not something that I ever wanted to implement but now I will have to. Regardless, I’ve been working long days. This weekend I had two twelve-hour days in a row and by the end of it I was so exhausted that I was somewhat delirious. Saturday was simply back-to-back clients (private, group and behavioural) and Sunday was my Dog Walker Course and then a dry-run of a new class that I’m excited to announce soon (be patient, it’s coming!). After our dry-run class on Sunday night, I was walking with my colleague back to her car with her pup when three dogs came running up to us off-leash. Her pup is not reactive or problematic in any way, but he is an unneutered adolescent male which means that other dogs may not be totally cool with him. I immediately went on the defensive as I know what Parker’s like with dogs like him and I didn’t want to see this guy get into a tussle. Clearly the owner wasn’t around so I body-blocked the dogs back a bit and then lured them back to their driveway. Thinking I was successful and taking it a step further, I asked them to stay as I turned to walk away. Stupid me. One of the dogs decided to take the opportunity to bark and lunge at me. I was about 2.5 feet away and he charged at me and gave me a muzzle-punch (level zero on a Cara Shannon Bite Hierarchy chart, so still considered an aggressive move). I walked away as I was tired, cranky and just in no mood to engage and with who? A dog? With no owner present? No thanks. I’d make a quick call to Animal Control and let them know that three dogs are lose and charging people and approaching dogs off leash on a busy intersection. They can take care of it. We get to the car and lo and behold, the three dogs come around the corner about 100 feet away, this time with their owner. We get the pup in the car and before we can close the hatchback, the three dogs are there, one approaching the back of the car where sits our lovely pup. I body block him back again and say to the owner “It’s not safe for your dog to approach – please call him off.” to which I got an snarly “Control YOUR dog.”I replied – “our dog IS controlled – you need to keep your dogs close to you.” She turned to me with her cranky sneer and says “What do you want me to do? LEASH my dogs?” I start to laugh mainly out of sheer sarcasm and a desperate attempt to not let violent tendencies overcome me. “Um, yeah. Since it IS the law. That WOULD be a good idea.” She tosses a few profanities my way and I turn my back on her as I say “Don’t you run a doggie business? I’ll be sure to spread the word.” She and her three little dogs walked away, off-leash while she texted on her phone without a second look at her dogs. I admit I was shaking and my colleague did not see the best side of me that day, but things like that really get my goat. It’s enough to make me use positive punishment on a human being. You know what I’m sayin’. Anyways, I headed home and called Toronto Police and Animal Control to file a full report. These dogs should not be loose, nor should that rude owner get off without at the very least, a warning. What happens if a reactive dog walks by and those dogs approach and it sends the reactive dog past his threshold and into an aggressive incident causing serious damage? Who’s in trouble now? Well, sure the dogs are off-leash and unsupervised and their owner will likely pay the fine, but the reactive dog has to contend with a serious setback – one that is quite traumatic to say the least. What if a child walks by and the dog decides that a muzzle-punch is old news and breaks skin? I hope this person makes the right decision and smartens up about her responsibilities as a pet-parent in our city. She makes us all look bad. It’s sad that she runs a business in the pet industry as she’s setting a terrible example for others and poisoning the industry as a whole. I’m a walking advertisement. When I walk my dogs and even when I’m out in public without them, I’m still representing Whatta Pup! so I act appropriately and reflect a professional image. (Yeah, we all have our bad days.) This woman isn’t aware of that, though. She is not someone I would ever hire or befriend. I certainly will make sure that she doesn’t get any of my business nor the business of anyone who asks me. People like that don’t deserve to succeed.